Party Area Restricted For PAID Party Guest ONLY!!!! 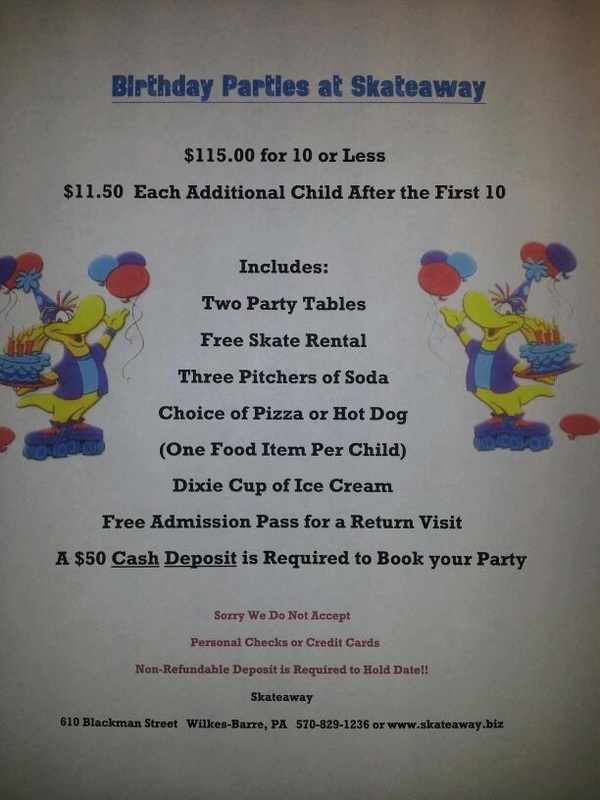 Regular Birthday Party Package: Party of 10 for $100.00 which includes: 10 admissions, 10 sodas, 10 ice creams, 10 free admission passes, regular skate rental ( if needed) (Low Cut rentals $3.00 per pair), each additional guest is only $8.50 per person. Birthday Party Package Plus: Party of 10 for $115.00 includes: same as the regular party plus: 10 slices of pizza or 10 hot dogs, 2 additional pictures of soda, each additional guest is only $10.00 per person. For each party package; you supply the cake and all the paper products and utensils for the party. Absolutely no outside food, drinks or snacks are allowed in the building. Parents with skating children skate free (only charge is $2.00 for rentals). Any adults skating with no children will be charged full price. All children entering the building will be charged whether skating or not. All parties will have all items removed from the tables and cleared out of the party room area 15 minutes before session ends. (570) 829-1236 or email us at Wilkesbarre@Skateaway.biz.